Catalogue The Store In-store Expires today! 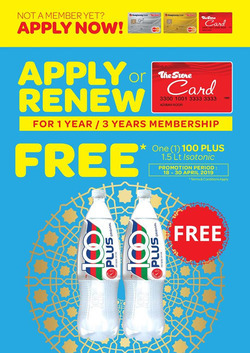 Get FREE One (1) 100 PLUS Isotonic1.5 Lt. (Original Flavour) if you Apply or Renew The Store Card for 1 year or 3 years membership. Visit our nearest The Store outlet today! Promotion starts 18 - 30 April 2019. Get KENNY'S Chicken & Soup Meal at a special price for 2 at RM31 ONLY! (NP: RM43). Enjoy this scrumptious meal at an amazing deals from now until 31 Dec 2019. The Store is a leading supermarket and departmental store chain in Malaysia. Do you want to receive more offers from The Store by email?